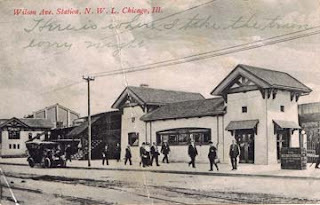 Well, we found another image of it, taken from behind, where you can see more of Broadway (then Evanston Avenue) in front of it. 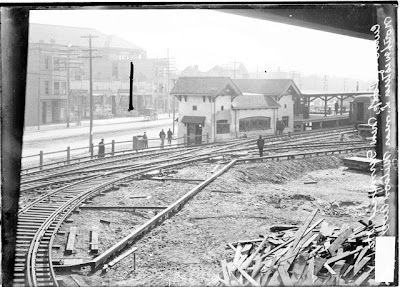 Original Caption: View of the curve in the train tracks at the Northwestern elevated railroad terminal near West Wilson Avenue in the Uptown community area in Chicago, Illinois. Image shows the terminal building and a stretch of curved track with building materials nearby. This next one, I believe, is from the station platform. 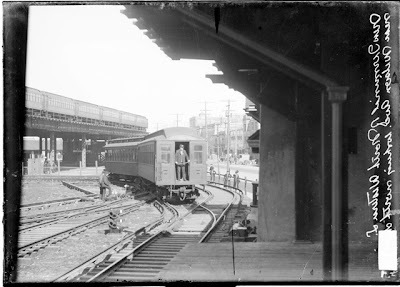 Original Caption: Image of a Northwestern line elevated train going around a curve in the track at the new terminal near West Wilson Avenue in the Uptown community area in Chicago, Illinois. A train is crossing a trestle in the background. Source: DN-0004736, Chicago Daily News negatives collection, Chicago Historical Society; DN-0004739, Chicago Daily News negatives collection, Chicago Historical Society.